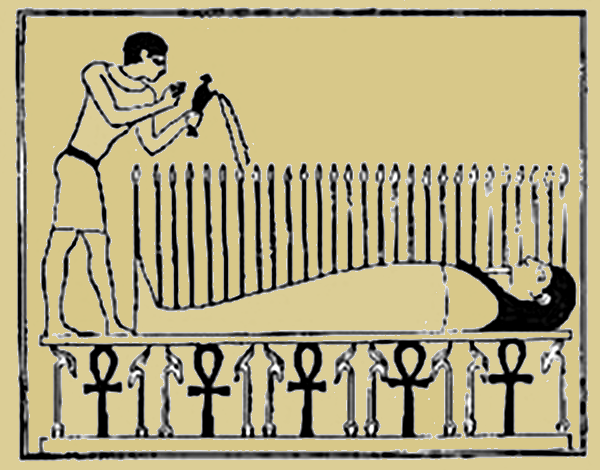 The Ausir Mysteries – Bast Side Project Begins! Remember a few posts ago, when I had deliberately made a few more sprouts? What happened to them? 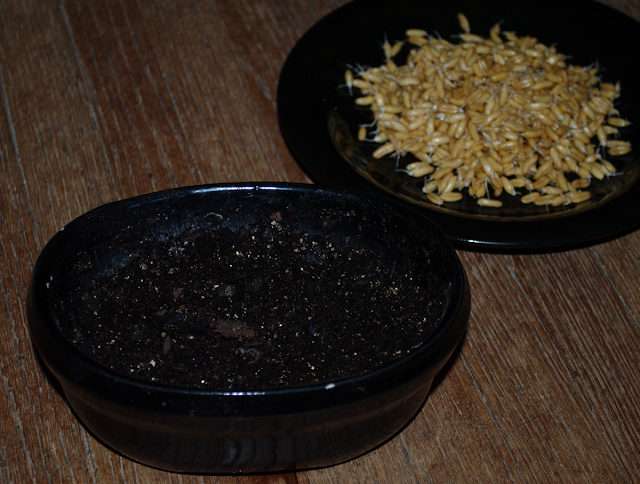 A shallow pot, and some potting soil. I had a spare bonsai pot sitting around, but you could use anything that will hold an inch or two of soil. If you use something too light it might get top-heavy and tip over. Having a hole in the bottom for water to drain will help. I used potting soil that I’d already used for something else. For this purpose you could use sand or dirt. It shouldn’t be that fussy. 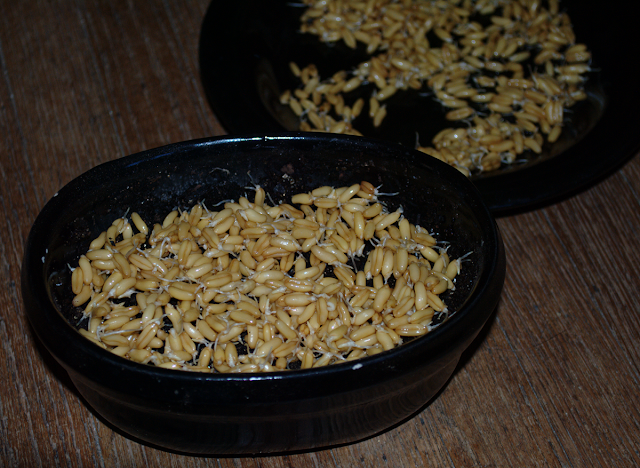 We’re not going to grow mature wheat, so we can plant the seeds more densely than they’d want as a crop. Cover up the sprouts with more soil. 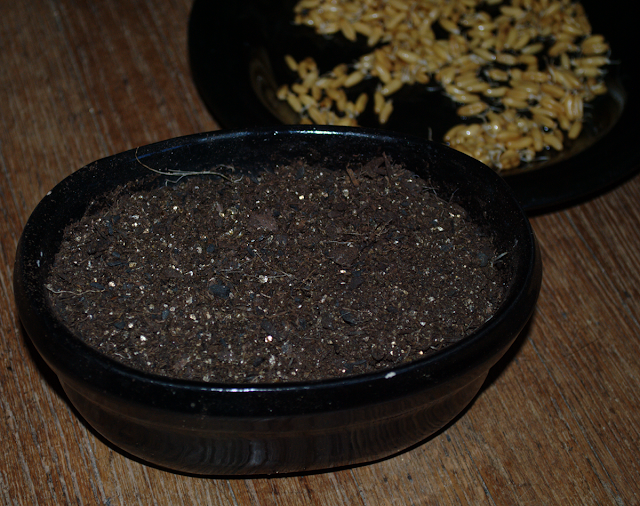 Add 3/8″ to 1/2″ of soil on top to cover them up. Then give them a good soaking. If your soil is dry like this you might use a spray bottle to wet it, or set it in a shallow pan of water and let the water wick up through the soil. If you do a full “inundation” all of your sprouts may end up floating. Note that I still had extra sprouts! 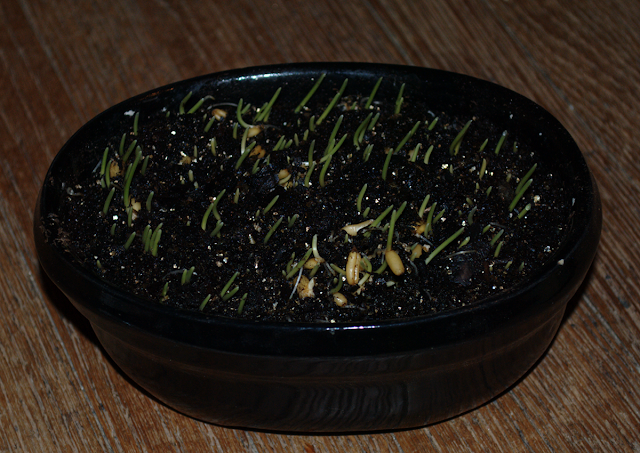 Now that the sprouts are in soil and know which way is up, they start growing quickly. It’s a race against competing weeds! 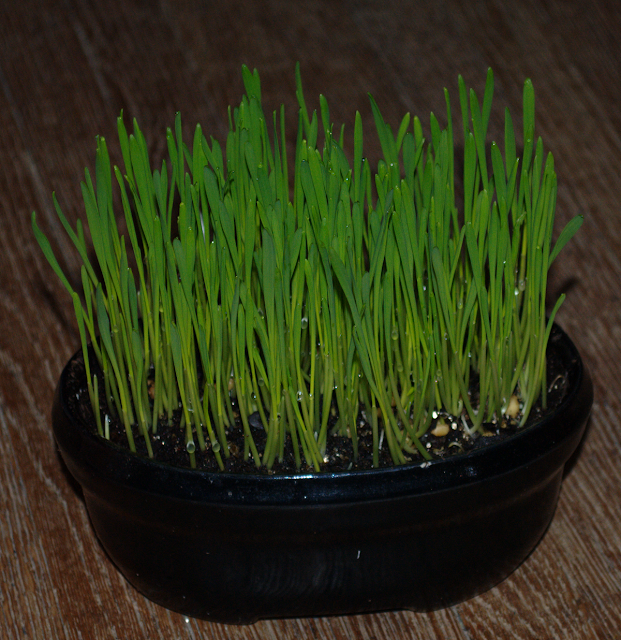 With the start they got from soaking, we get wheat grass quickly. I put them in a sunny window and this is the result. This is from the temple of Isis on Philae. There are some ancient brick planters shown here and here. Do the sprouts in the second one look familiar? Tune in next time for the exciting conclusion! 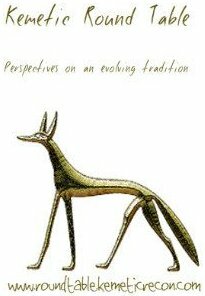 Same Bast time, same Bast channel! 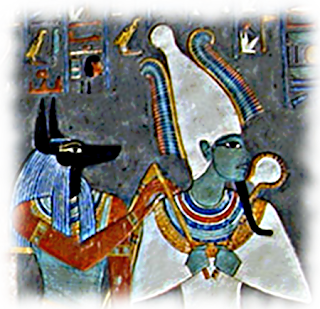 This entry was posted in Afterlife, DIY, Gods & Goddesses, Modern Practice, Offerings, Ritual and tagged Aset, Ausir, Bast, DIY, festival, offerings, Osiris, Wesir by helmsin2. Bookmark the permalink.